Villa Fresno offers picturesque mountain views from its countryside setting, not to mention a spacious pool terrace for sunbathing, plus all you need for alfresco dining. This 4 bedroom villas is set beneath the Montogo Mountain in Javea, no more than 10 minutes' drive to the sandy Arenal Beach - What's not to love? You'll also be within easy driving distance of the old town and port. WiFi, pool heating and air conditioning/heating in the bedrooms are included. Great views of the Montgo Mountain plus within walking distance to a Michelin Star restaurant. Within easy reach of Arenal Beach too! The private pool has plenty of space surrounding it for sunbathing and taking in the views of the Montgo Mountain. There's a poolside brick BBQ meaning tasty meals can be cooked and enjoyed alfresco at the table and chairs on the shaded terrace. If you are feeling energetic, the game tables provide fun for the whole family. The grounds of this detached villa are totally enclosed. Entrance is through the gates to off road parking with space for 2 cars. There are 12 steps leading to the front door which opens into the hallway. The open plan lounge, kitchen and dining area is pleasantly furnished with 3 sofas facing the TV, and a dining table and chairs for entertaining your party. There are patio doors leading out onto a covered terrace, which also keep the room light and airy. The fully equipped kitchen has all you need for preparing tasty meals. A washing machine and sink are found in the utility cupboard outside. On the ground floor there's a double bedroom with en suite bathroom as well as 2 twin bedrooms sharing a separate bathroom. There is also a separate WC on this floor. Upstairs leads to a galleried landing overlooking the living area, and a double bedroom with an en suite shower and a private terrace. All bedrooms are comfortably furnished with ample storage space. This villa is registered and licenced by the Generalitat Valenciana to comply with local legislation on holiday rentals. This number is: AT-441329-A. 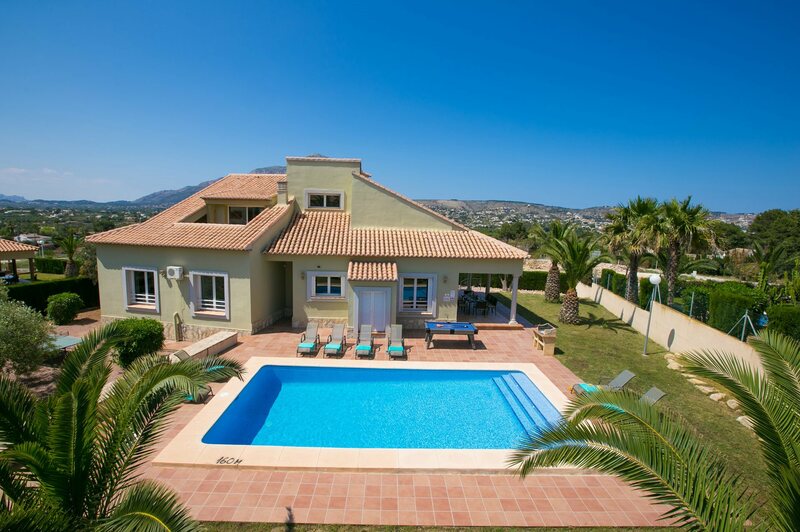 Villa Fresno is located in the Pivars area of Javea, with fantastic views of the Montgo Mountain. There's a Michelin Star restaurant within walking distance and, for a wider choice, the popular Arenal Beach is 10 minutes' drive away where bars and restaurants line the promenade. The port and Javea Old Town with its cobbled streets and authentic tapas bars are around 10 minutes' away by car too. Our villas Limones, Eucalipto, Olmo, Elefante, Cabriel and Castano are in the same cluster of houses. The traditional Javea Old Town is 2½ miles away with plenty of shops to browse, as you walk through the cobbled streets. There's an open-air market every Thursday morning, selling anything from food and clothing to toys and souvenirs. You'll also find a daily food market by the side of the church, selling local product so why not stock up for a BBQ? The Blue Flag Arenal Beach, in Javea, is great for families with soft golden sand and clear waters. The promenade lines the beach and stretches for 1½ miles and is only 10 minutes' drive away. There is also the pebbly La Grava Beach, near to Javea Port lined with some tapas restaurants. Alternatively, visit Grandella Beach - a stunning pebble bay, voted one of the best beaches in Spain several years running. Why not try a Kayak or paddle boarding lesson while you're there? Javea is a family-oriented resort with Arenal Beach with activities ranging from sand castle competitions to scuba diving. Go-karting is very popular in Javea, along with paddle tennis and mini golf. There are also banana boats or glass bottomed boat trips in the nearby resort of Denia. Javea is set at the most easterly tip of Spain, sitting in between the beautiful cities of Valencia and Alicante. Both cities are around 1½ hours' drive away. Valencia is known as the City of Arts and Sciences with its futuristic buildings, including a museum and planetarium. Whilst Alicante is a city and port with plenty of shops and restaurants to explore. If you prefer to stay closer to home, take a trip into the old town of Javea and explore the shaded cobbled streets and white washed houses. There is a 9-hole golf course near Benitachell on the outskirts of Javea or a championship course at the Marriott Golf and Spa resort on the road to Denia from Javea. Mount Montgo rises above Javea with its orange and grey rock resembling the head of an elephant. For the active members of the group, there are many signposted walks on the slopes of this National Park but make sure you avoid the heat of the day. Villa Fresno is not available to book for season as it is sold out. Take a look here at the Costa Blanca villas that are currently on sale. Great pool size, very clean. Great outside seating away from the sun, if you did not want to sunbathe all day.